TJK Wolf Productions is a premier sports team and individual photography company. The dreaded picture day of the past is gone!! We make picture day fun and easy for both coaches and parents. Schedule your Picture Day: Schedule a date as soon as uniforms come in. Weekend dates fill up fast. It’s best if you can secure an indoor location for your picture day to rule out any cancellations due to weather. How the Process works: TJK Wolf will provide each team with a coaches packet. The packet will include tips for a successful picture day and pre-pay envelopes. Coaches hand out the Pre-pay envelope 1 week prior to picture day. 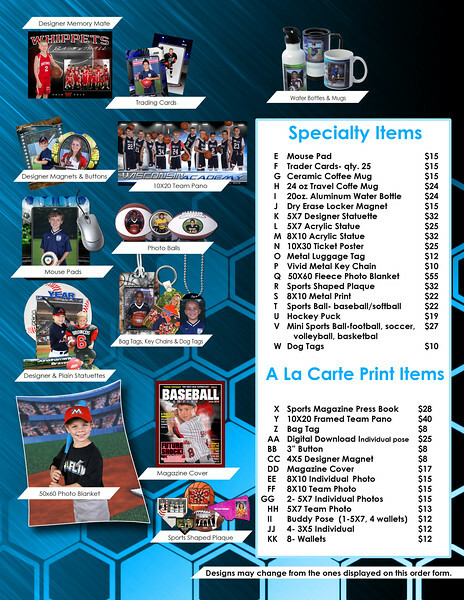 Online ordering is available after picture day, but pricing and products may vary from pre-pay. We accept cash, check and credit cards. Players are able to come anytime during photo hours. Photos will be taken on a green screen and composited into the background for an individual and team photo. Which means no waiting around for a group team photo. Picture Day: TJK Wolf will arrive at the selected photo location 1 hour prior to set up. A team representative will need to be available to direct our team to the set up location. When players get to the photo location: Check in at the registration table. Turn in your completed order form, with payment (credit cards will be accepted at the table, checks written to TJK Wolf Productions) Get your name card- check for correct spelling of your name and team. Go to the photo station Give your card to the photographer Get your picture taken. You can expect your photos delivered back to the league 3 weeks after the last photo date. Online ordering will open at that time. Each coach receives a complementary 8X10 Team Photo. Home Delivery Option available: all photos/items would be mailed to the address provided by the customer. An additional $5.25 will be added to the order. Speciality items such as mugs may incur an additional shipping charge. You can expect your photos 3-4 weeks after the last photo date. pricing is based on TJK Wolf Productions being contracted for T&I for that season. Not interested in green screen compositing, that’s ok!! 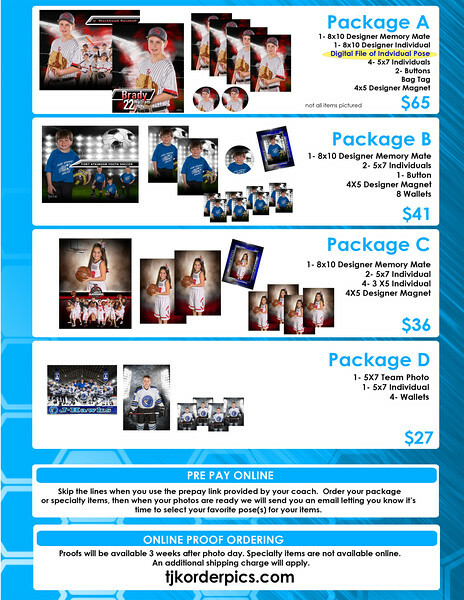 We also offer traditional team and individual photos done in the gym or on the field.